Balloons always makes kids smile — don’t they? I always litter our living room floor with balloons when it’s time to par-tay. But any day is the perfect day to craft with latex balloons, or create the cutest paper balloons on earth! 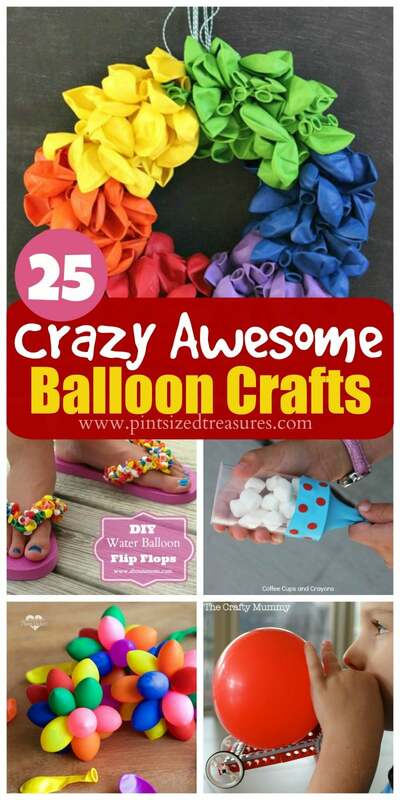 Either way, you’ll love these crazy awesome, balloon crafts! Coolest balloon ever award goes to Michelle at Crafty Morning for her Spinning 3D Hot Air Balloon Craft. Seriously — you have to make it! Sharla did an awesome job with these sensory balls that are made out of — you guessed it — balloons! My kids love puppies! I know I will be super-mom if we make these Balloon Puppies. Summer is the time for super-cute shoes. Check out these DIY water Balloon Flip Flops. Fingerprints can create the cutest hot air balloons in this craft. Create a yo-yo from a balloon? For sure! Check out Balloon Yo-Yos! All those science-lover kids will love hover crafts that’s made from balloons. Birthday wreaths don’t get any cuter than this one made from balloons! What?! Frozen dinosaur eggs made with balloons? How cool is that! Dig out your cupcake liners for this fun Hot Air Balloon Craft. This is the sweetest home-made card ever for fans of balloons. Watch out for flying marshmallows when this Marshmallow Shooters Craft is around the house! Zip lines are the coolest in the summer fun category! Can’t wait to make this Water Balloon Zip Line with my kiddos! Who knew balloons could create such awesomeness like Paper Mache Beehives and Bumble Bees? And they make penguins too! This Pom Pom Shooter is bound to be a fave with my girls! The cuteness doesn’t end with this Ladybug Craft. I’m ready for a fiesta! This Pinanta will add the perfect touch to the party! Make fruit super-fun to your kids when you make DIY Fruit Balloons. These are squishy, bouncy and colorful! Rainbow Sensory Balloon Balls are boudn to make your kiddos smile and giggle! Playing with ice is almost fun a playing with balloons! You can play with both in this Marble Painting craft. Here’s another fun twist to Balloon Flip Flops. Your kids will look adorable with these Diy Balloon Bracelets. Legos, cars and balloons all in this Balloon Powered Lego Car. These whimsical balloon characters can inspire story-telling and giggles! Perfect for a fun, family night! 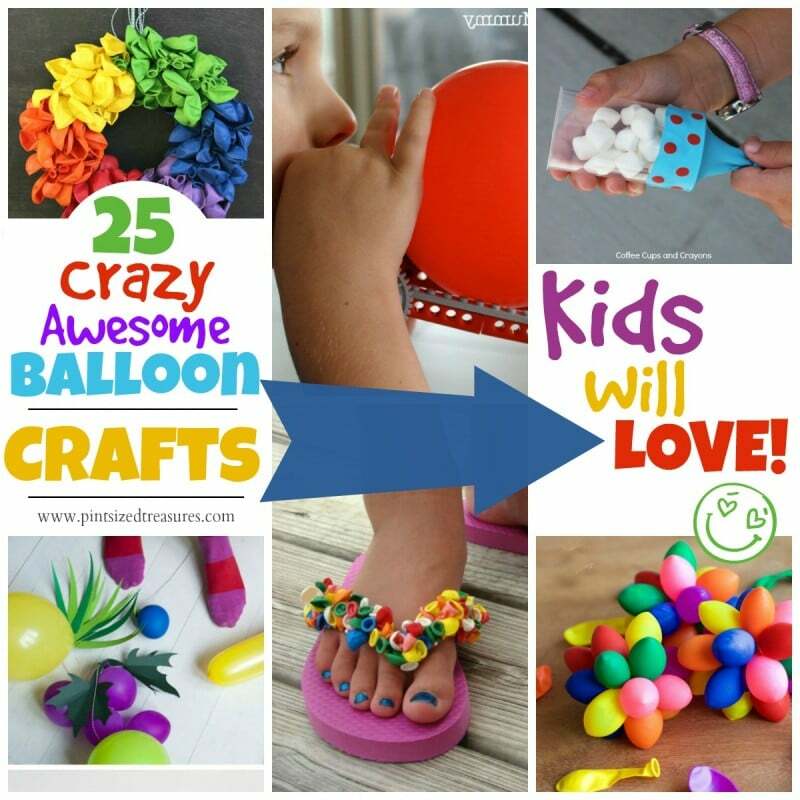 Which balloon craft will you make first?